With such a vast array of angle grinders available, it can be a somewhat time-consuming task to go through and individually inspect each model, let alone research the type of angle grinder you need. 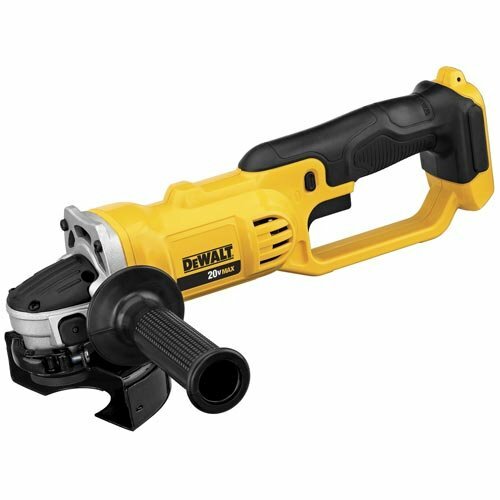 So, in order to help out, we’ll take a comprehensive look at one of the more popular angle grinders currently being sold on the market, which is the Dewalt DCG412B. We’ll look at its functionality and features as well as possible alternatives before offering our verdict on the product. This way, you can determine whether the Dewalt DCG412B is the right fit for you or not. Dewalt is one of the longest running power tool brands. Founded in 1923, Dewalt has gone on to produce some of the highest quality contractor tools available on the market, making them well recognized for the quality of craftsmanship of their products. Black and Decker, which is extremely popular for lightweight household power tools, bought the company in 1960. Hence, Dewalt became the face of their heavy-duty tools. Amongst these tools, the Dewalt DCG412B is marketed as one of their most functional yet affordable products that are fantastic for light to medium use. With an approximate size of 7.3 x 16.8 x 4.8 inches, you won’t be cutting through any large paving slabs or overly think sheet metals with this tool. However, it is great for every day grinding jobs such as rebar cutting and surface prepping. Utilizing a 20V lithium-Ion battery for its power, this unit offers a vast range of mobility and convenience to the user as it’s easily transported and stored. Its size also makes it incredibly lightweight and easy to handle allowing you to take on more delicate or meticulous jobs with ease. Its popular 4-1/2″ to 5″ grinder size makes it extremely well suited to a host of tasks as you’re able to fit numerous disc sizes onto the grinder. All of these points make it great for someone who needs a reliable angle grinder that can be used in a variety of situations and places as well as being kept without taking too much space for household use. The Dewalt DCG412B is an extraordinarily portable or mobile tool since it is powered by a battery, which you need to purchase separately. It is equipped with an 8,000 RPM motor that delivers high power and effective cutting as well as grinding capabilities. This tool also has a quick-change wheel release, ridding the need for a wrench. It also has a two-finger trigger switch lock-off for added safety, while the two-position side handle is integrated to provide greater control and stability, allowing you to make precise cuts or grinds. Coming in at a weight of about 5.1 pounds, you can easily carry it around and tow it in a bag or case. The product also has a mesh covering to prevent any debris from entering the vents, helping reduce maintenance frequencies. As with all angle grinders, the Dewalt DCG412B is a heavy-duty power tool that needs to be used with extreme care. When using an angle grinder, it’s always a good idea to cut at a 90º angle perpendicular to the intended cut site since this will help reduce the chance of the disc glancing off while also providing the cleanest possible cut. When grinding, be sure to attain a sturdy grip of the unit and adopt a powerful stance that’ll allow you to move with the machine. It’s also a good practice to not only use the locking features when the grinder is not in use but also to remove the battery, as this will not only increase the general level of safety but will also prolong the battery’s life expectancy. For those looking to stick with a brand they can trust but are also looking for an angle grinder with a bit more power behind it, then the Dewalt DCG414N might be a perfect choice. With a no-load speed of 9,000 RPM and 54-volt power supply, this model can take on more extensive uses than the DCG412B with ease. It also features an e-clutch with stall protection that’ll automatically shut down the tool. For the more budget conscious among us who are willing to try something new, it might worth considering the Ryobi P421 Angle Grinder. It does feature a lower RPM of 6,500 alongside an 18-volt battery but it is still more than capable of performing a variety of tasks. It’s also able to accommodate 4 1/2″ discs and also has a three-position side handle for added comfort and control. The Dewalt DCG412B is a great all-around unit that can fulfill a variety of household tasks as well as compete in the contractor industry. Its extreme convenience makes it an excellent choice for all the less strenuous jobs around the worksite as it can easily hang from your work belt. The only downside to this unit is its limited disc size, but this is more than common in battery operated angle grinders. Likewise, larger jobs often require corded or petrol driven grinders.